I have two sons. Two happy, healthy, bright, beautiful sons. And nearly every day someone asks me if I'm going to try for a girl. It is such a rude, wrong, offensive, presumptuous and mean question. So, stop it. Seriously, when did this become a thing? When did people decide they could just ask strangers if they were satisfied with their children? When my second son was three weeks old, we took him and my older son to a restaurant. Looking at my blue-clad newborn, the first thing the server said to us was, "So, you're going to try for the girl next?" Three weeks old. I still looked pregnant and the server asked when I was going to try for another baby. Not just any other baby, though: a girl. The truth is that yeah, I did want a girl. I mean, I really wanted a girl. I even wrote an article about it. And every time someone asks me if I'm "going for the girl," it's another gut punch reminding me that I don't have a girl. That I won't be able to braid my daughter's hair, teach her about feminist icons or help pick out her wedding dress (if and when she chose to get married). Every day or two I get to smile cheerfully, shake my head and mourn the daughter I always thought I would have. So, thanks for that, strangers. You know what else is awesome? When my son hears this crap. Nearly five, what must he think when someone asks me if I'm going to try for a girl? That he's not good enough because he's not a girl? I always respond by saying how wonderful my boys are, but at what point will he start to internalize the message that babies are only worth having if they're girls? I'm luckier than most to have two children. During my older son's emergency C-section, I discovered that I have a uterine anomaly -- I only have half of a functional uterus; in fact, the entire left side of my reproductive system is nonfunctional. I was lucky to get pregnant twice, even more so to carry to term twice. Even when I'm having a really hard time with them, I try to remain cognizant that my children truly are something of a miracle; often, my anomaly can render women infertile. So do I want to try for a girl? I don't even know if I could get pregnant again even if I wanted a third child. But what if I did want a third child and couldn't get pregnant? I didn't have to explore fertility options prior to my pregnancies, but what about the women who did? What about women who have had miscarriages or abortions? Do they want to be reminded about the babies they never had? And worse, what about women who have lost a child? I can't even imagine how devastating it would be fielding these comments day and day out, had I lost a little girl. Lastly, my reproductive choices are no one's business. I'm a pretty open person. After all, I write personal essays about my life and share them on the internet. You can't get much more open than that. But even I don't want to talk about my reproductive choices with a stranger. I don't want to have to laugh off something that is a real, serious, and sensitive issue. 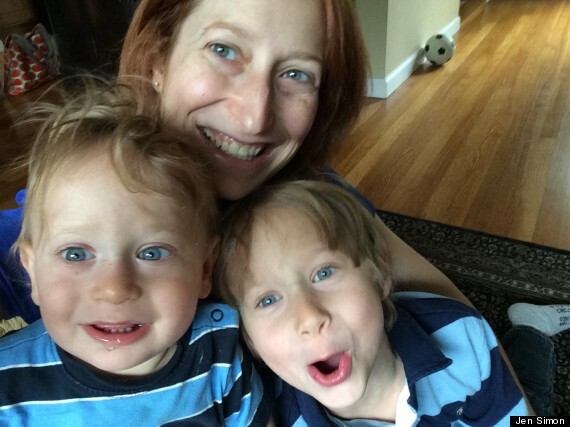 I don't want to justify my sons' gender or my choice to not have a third child. So, the next time you see a parent at the playground, find something innocuous to ask about. Do not ask parents of boys if they want a girl. Do not ask parents of girls if they want a boy. Do not ask parents of one child when they're going to have another. Do not ask parents of multiple children why they have so many. There's no reason for it. It's none of your business. And you have no idea what the family has gone through, child-wise. This piece first ran on BLUNTMoms.